Happy Valentines Day everyone. Valentines Day is a funny day, if you look at the history of it, it is another Christian holiday that has been watered down and materialized over the years. Oh well. It is fun to share with your loved ones how much they mean to you….but we should make that effort daily eh? I have had a overly indulgent Valentines season. It started with a trip to Vancouver to see some of my favourite gurlz, a first of it’s kind, bringing us from one coast to the other together for friend time. We had an amazing dinner at Raincity Grill in the West End, a well known eatery and a pioneer in farm-to-table menus. I could go on about the meal, if you are there and have the opportunity, go to this restaurant. The sweetest thing about the night is we caught an additional week of the annual Dine Out Vancouver and enjoyed so much of the amazing menu for a package price – and even got the Creme Brulee without ordering the menu to go with it, wink, wink. 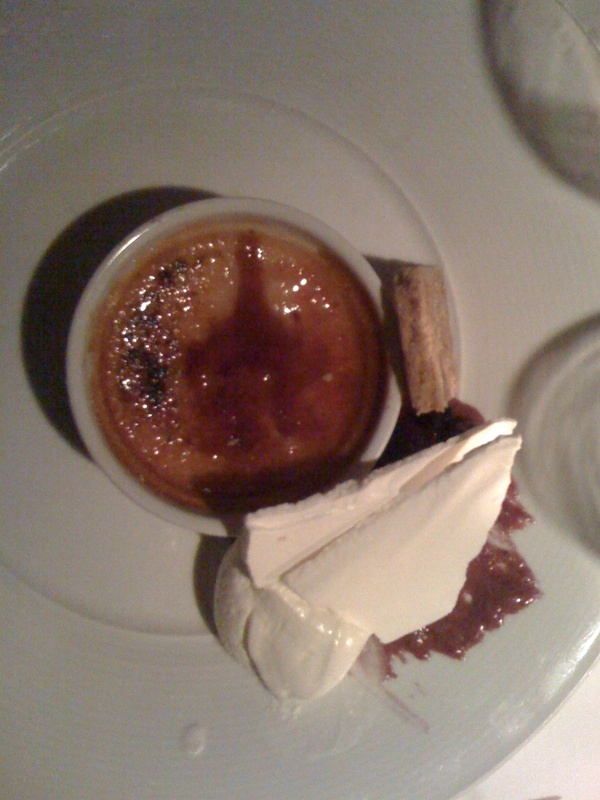 Now this was the BEST creme brulee any of us have ever had. It was a pumpkin brulee with a berry compote, vanilla creme and almond shortbread cookie. Enough said. While in Vancouver I get my fill of cupcakes. I know I talk a lot about cupcakes, they are my favourite indulgence, passe or not :). These are not just any cupcakes though, these are the BEST cupcakes. Cupcakes is the original cupcakes of the west. Their cake and icing are perfect. I picked up two, yes two, ate one, the best red velvet I’ve had since Santa Monica (another story), went back and got a refill to bring them home (and a mini to eat). Tony and I indulged in them on Saturday night. Sweet. And the icing on the cake, Valentines Day. 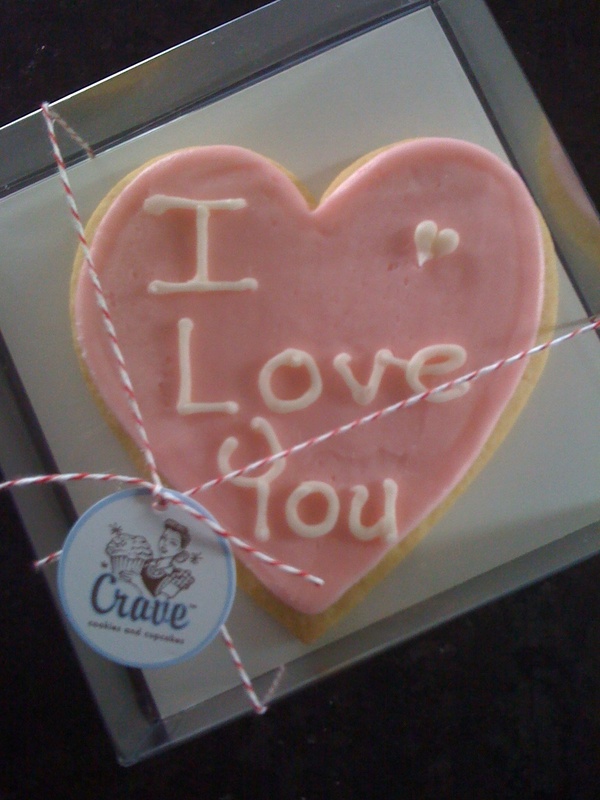 I’m not sure how I missed it most of the day yesterday, but hiding in the fridge were sweet treats from Crave. Tony said he watched me open the left door on the fridge and never the right all day, they were right there under my nose! I opened the fridge this morning and staring at me was this sweet treat, cupcakes and this sweet cookie. I have been nibbling on the cookie all day…we’ll save the cupcakes for the weekend. Cupcakes keep very well in the freezer. I have frozen them in Vancouver and then flew home with them, keeps the icing in tact. Obsessed? Maybe. I know I say indulging in sweet treats is nice once in awhile, but I’ll be needing a sugar holiday for a long time from this indulgence!